If you’ve spent any time in San Francisco you have likely encountered Market Street. It’s the busiest street in the city, but also one of the most dangerous. It’s a “grand boulevard” that connects the iconic Ferry Building to the majestic hills of Twin Peaks, but it’s also the dividing line between two opposing street grids. It should be the street that binds the city together but it often feels like San Francisco’s most dysfunctional public space. San Francisco is staging an ambitious do-over of Market Street in 2018. In preparation for that, the San Francisco Planning Department, the Yerba Buena Center for the Arts and the Knight Foundation are sponsoring a four-day festival — the Market Street Prototyping Festival — to give more than 50 teams of designers a chance to try out small-scale interventions on the street. There will be whimsical street furniture, public sculpture and even a mobile library. The festival isn’t meant to address the big, intractable problems on the street, but it will start a conversation about how to make Market Street better. To give that conversation context, I spent the last three months reporting and producing a Detour about the urban planning history Market Street. 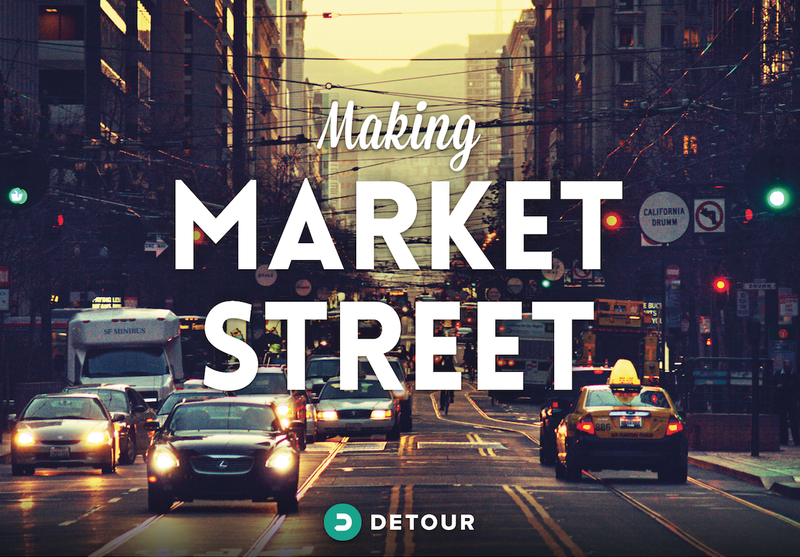 Detour, if you didn’t already know, is a new company that offers gorgeous, location-aware walking tours via an app on your smart phone. The company just launched in February, and is currently offering nine different tours in San Francisco, as well as one in Austin produced in collaboration with Radiolab. This Detour is a must-walk for anyone interested in urban planning, architecture, city history or the built environment. (In other words, if you are a city nerd like me.) I did a deep dive into 150 years of planning decisions to piece apart why and how San Francisco ended up with the Market Street it did. Along the way I found a savvy Gold-Rush-era land surveyor, a starry-eyed Belle Epoch architect, a team of ambitious mid-century engineers, a radical, utopian-minded punk squatter and a host of other characters whose individual visions for Market Street produced the complicated thoroughfare we have today. Because Detours are location-aware pieces, you can only experience them if you are on location, ie, in San Francisco. (Detour will expand into other cities later this year.) But if you are in the city by the Bay, you’re in luck: the Detour is free this week only. You can take the Detours on your own any time you’d like . . . OK actually during the open hours for the Main Branch of the San Francisco Public Library, which is the first main stop on the Detour. But if you want the red carpet experience, you can sign up for a “Meet the Creators” scheduled Detour. I won’t be there unfortunately, as I am in Mississippi this week reporting my next story. BUT you will get to meet my editor, Ben Adair, or one of my co-producers, or Jonathan Pearlman, the amazing architect and preservationist who narrates the piece. As Jonathan says, if we’ve done our job right, by the time you’re done with this Detour you won’t see any city in quite the same way.